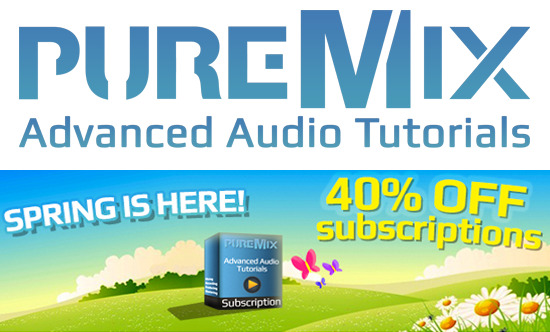 Until 1st April 2015 PureMix are offering 30% off their monthly subscriptions and 40% off their annual subscriptions in their Spring Sale. If you are already a PureMix subscriber you can advantage of this offer and PureMix will automatically extend your subscription period appropriately. As a PureMix subscriber you have unlimited access to all their tutorials, access to the private PureMix Forum, and access to the Mix Analysis and Mix Contests too. Not only that, but you get a free Plug & Mix plug-in worth $59, if you are a new PureMix customer. You are also eligible to discounts on a range of products including Angelbird SSD Drives, plug-ins from Sonnox, Flux::, and Blue Cat audio as well as a discount on all products from Don't Crack.